Each panel features an energy efficient thermal break that effectively separates the inner and outer skins of the panel, reducing thermal transmission from the front to the back of the door. Then the complete sealing system, between the panels, and around the door, work to combat air migration – making the B&D Enviropanel the perfect choice when you want to minimise household heating or cooling costs. The Enviropanel also features a purpose designed thermal break that does not have metal-to-metal contact from one side of the door to the other. It is constructed from quality Expanded Polystrene (EPS) resulting in minimal ‘thermal drift’ – this means the product will retain its insulation properties longer than other comparable materials. 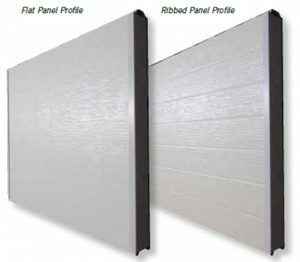 The Enviropanel is available in two contemporary profiles – Flat and Ribbed. Both styles feature the embossed texture. Available in sizes from 1841mm to 4265mm in height and from 1750mm to 5864mm in width. Enviropanel doors are available in the standard B&D colour range, however, lighter colours are recommended to improve overall insulation performance. Jamb seals are available in 4 colours. It’s important to have peace of mind when you make a purchase, that’s why your B&D Enviropanel™ door, in residential applications, comes with a 12 month warranty, conditional on proper care, as recommended in the door’s handbook. Full details of the warranty are available from www.bnd.com.au. 12 month warranty only applies to doors purchased and installed in Australia or New Zealand. Warranty only valid if warranty conditions are met.